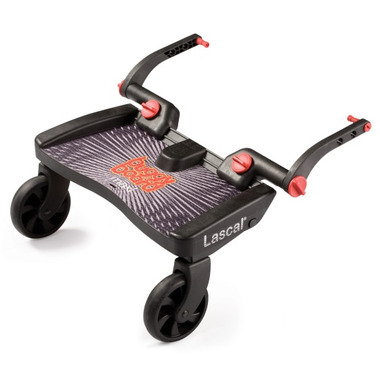 A stand-on platform that attaches to your pushchair or pram, allowing an older brother or sister to ride along when he/she is too tired to walk. BuggyBoard provides security for your child in crowds and high traffic areas. When your child is too tired to walk, or when you are in a hurry, the BuggyBoard makes it easy for both of you. The BuggyBoard™ has a universal fit making it suitable for almost all buggies and prams. Great buggy board. Easy to install and I really like how easy it is to remove when not in use. Fits my old peg perego skate really well. This buggy board is a fantastic add-on to our summer infant 3d stroller. The board is so easy to put on and take off. Travelling is a bit noisier with it on but that's not a problem. My 3 year old absolutely loves it! Great universal buggy board, attached easily to my Mountain Buggy Nano. It easily pops on and off quite effortlessly. I especially like the size of the larger board, as my daughter can even sit on it if she's really tired. Fantastic product that fits into our Mamas and Papas stroller. Now my 2 year old (who won't sit in a stroller for longer than 2 minutes) has a place to rest when we walk to the park. The only downside is that it has to be removed before the stroller is folded down each time.